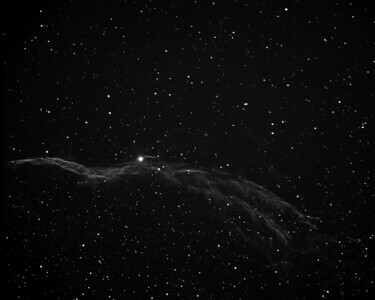 Western Veil Nebula(NGC6960) HyperStar narrowband capture. 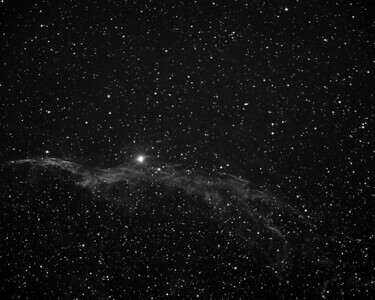 This imaging session was done from my driveway, in the red/orange zone of the light pollution area of the city. Used my Celestron EdgeHD11 with a HyperStar attached, on an Atlas Pro AZ/EQ-G mount. Guiding was accomplished using an Orion mini-guider. Capturing camera was an Atik 460ex mono. Used Astrodon narrowband 5nm H-alpha and OIII filters. Captured 20x5min lights for each channel. Unfortunately, I messed up the Flats capture, so I couldn't use them. No darks applied either. Post processing was done with PixInsight and Photoshop CS6. 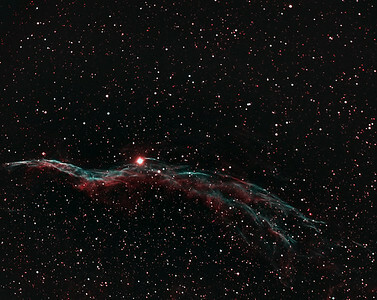 I'm still trying to get a handle on how to correctly capture and process narrowband images with the HyperStar attached. It's not easy, especially with trying to get the star colors right. Focusing also continues to be a challenge, as the HyperStar is very sensitive to the slightest focal adjustment. Used the HOO (Ha-Red, Green-OIII, Blue-OIII) color palette for the mapping the RGB colors, which seems to work the best with this particular nebula. I've included the separate Ha and OIII frames. You will notice that this nebula has a higher sensitivity in the OIII band, bringing out more of those nice fine structures, compared to Ha. Interestingly, Ha produces a greater star field.